This Spring, an annual fashion trend will return to the campus of California State University–Long Beach. As the familiar sounds of “Pomp and Circumstance” carry across the vast lawns, students will arrive decked out in highly customized graduation caps. Some will have scoured Pinterest pages and YouTube videos for tutorials and inspiration. Using an assortment of materials—foam letters, cotton balls, paint, glitter, synthetic flora—students will adorn their mortarboards with inspirational messages (“The best is yet to come!”), shout-outs to their families (“Gracias Mami y Papi”), indications of their background (“1st Gen”), political statements (“Dreams without Borders”), and obscure pop cultural references (“Bears, Beets, Bachelor’s Degrees”). 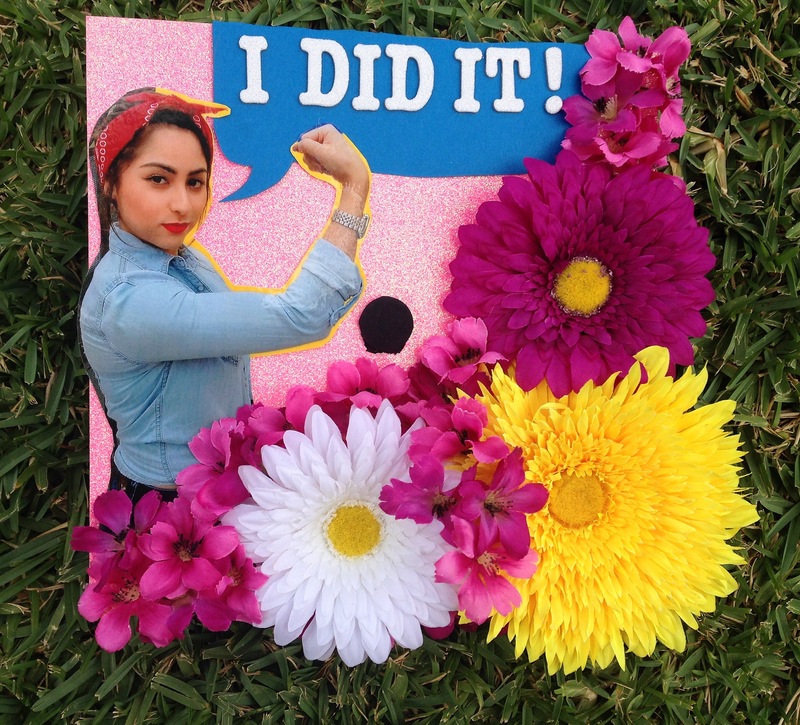 The proverbial “walk across the stage” is transformed into a catwalk of colorful DIY messages. The fact that students on our campus see their graduation caps as a 100 square-inch canvas may reflect who they are and their journey through higher education. Students of color make up nearly 80% of the Long Beach campus, and the New York Times recently named it among the nation’s top ten “working class colleges” that successfully move large proportions of lower-income students into higher earning income brackets. Perhaps for these students, personalized caps signify more than just individual academic achievement. To get a better sense of what graduation attire may mean, we can also look to representations of caps and gowns in communities of color more broadly. For generations, students of color have donned cultural stoles and other accoutrements that can now be ordered from a catalog. But this apparel can also have a more subversive edge. Seeking symbols through which to make broad moral appeals and to legitimize their demands, social movements dig deep into the cultural resources available to them, Activists, particularly in recent years, have utilized caps and gowns to clothe their struggles on the public stage. Undocumented student activists, for instance, have been emboldened to announce their immigration status to the world when shielded by academic dress. In 2010, a small group of undocumented youth dressed in caps and gowns risked deportation when they staged a sit-in over immigration reform at Senator John McCain’s office. Leading up to the passage of the DREAM Act, coverage of rallies and demonstrations prominently featured young people wearing graduation gear. In her analysis of DREAMer visual culture, Latinidad scholar Marta Caminero-Santangelo finds that caps and gowns have been a consistent presence in murals, political cartoons, and other media. They symbolize the structurally “stunted” potential of these young people, she argues, but also help them to be seen and publicly acknowledged. The getup has also made a noteworthy appearance in the online spheres of Black Lives Matter activism. During an interview following her son’s death at the hands of Ferguson police, Lesley McSpadden reflected tearfully on an under-appreciated aspect of Mike Brown’s short life. She asked, “Do you know how hard it was for me to get him to stay in school and graduate?” In the months and years since, the image of Brown wearing his green and red high school regalia has circulated globally, urging a counternarrative to racist, broad-stroke “thuggery.” The discrepancy between these representations of Brown inspired social media users in the Black Twitterverse to post contrasting images of themselves, asking which the media would use #IfTheyGunnedMeDown. But do caps and gowns succumb to respectability politics even when wielded in protest? 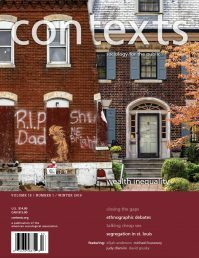 In her recent book, Curated Stories: The Uses and Misuses of Storytelling, political economist Sujatha Fernandes asserts that elevating higher-achieving DREAMers as more worthy of public sympathy may unintentionally further marginalize those in the often exploited, undocumented workforce. Are demands for dignity, amnesty, or life itself any less legitimate, activists ask, if not costumed in the garb of meritocratic achievement? Despite the conflicted meanings and usages of these garments, their presence in social movements signals their enduring political cachet in American society. 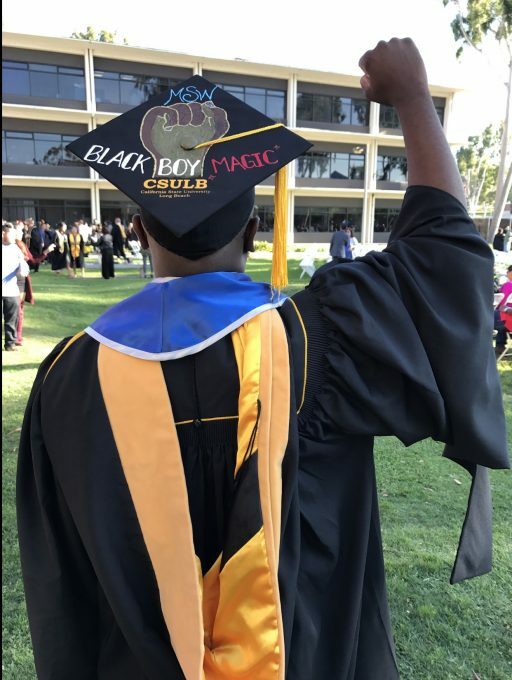 As students of color at CSU Long Beach decorate their caps for a variety of reasons—some lighthearted, some serious—we may be curious about how they understand their own use of this potent symbol. Diana Crane, a sociologist of fashion, notes that while style can function to constrain (think of the suffocating corsets of Victorian times), it can also present a site of agency. Even during an event that demands some level of conformity in appearance, students’ mortarboards become a site of cultural production deeply rooted in their experiences and identities. 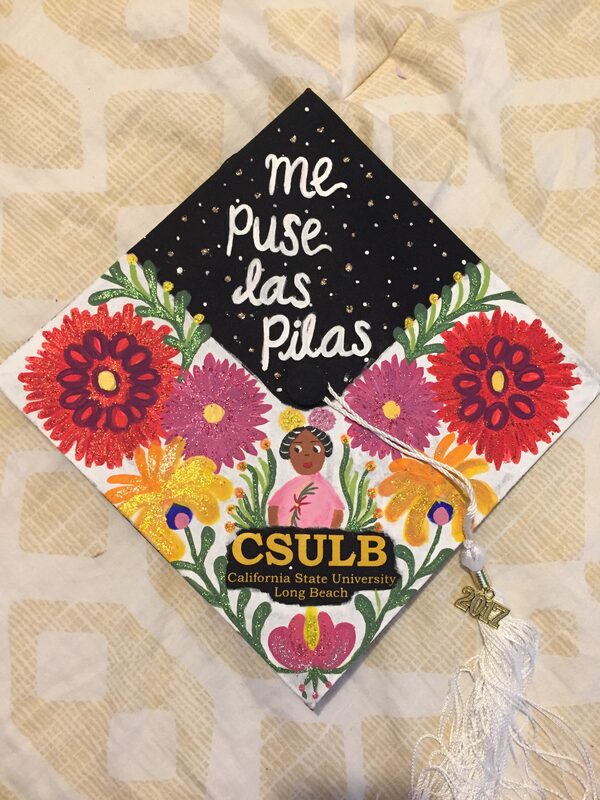 Seeking to decode these messages, I put out a call for 2017 graduates of color to submit pictures of their caps and share the stories behind them. I also reviewed social media postings and pictures of caps from last year’s graduation ceremonies. The complex themes communicated through the caps focused on identity, political context, and connections to their educational experiences. The students I heard from most often decorated their caps to broadcast who they are and where they come from. Unapologetic references to their intersectional identities, culture, ancestors, and families abound. Several caps included versions of the popular Spanish saying, ponte las pilas (literally: “turn your batteries on”), recalling their parents’ instructions to focus and graduate. Rhea-Comfort included Haitian and Ghanian flags on her cap as a nod to her mother’s and father’s journey to the U.S. and to mark her graduation as their shared milestone. “As I walked across the stage on graduation day,” she said, “it felt as if my parents were walking alongside me.” Students celebrate their accomplishments by commemorating the sacrifices, encouragement, migrations, and cultural heritage that got them there. These messages illustrate what critical race scholar Tara Yosso has termed “cultural wealth,” the underappreciated forms of knowledge, skills, and contacts that students of color call upon when navigating educational institutions. As the first graduating class of the Trump era, I expected that 2017 mortarboards would prominently feature messages targeting the administration and its policies. Despite many caps invoking political themes, direct references to the president were minimal. In response to the racist rhetoric of the Trump administration, one student, Vivianne, used her cap design to “show unity during these hard times and show that women and people of color are capable of reaching their goals and are not criminals.” Among the other issues students raised, from education financing to the first-generation college experience, we are reminded that our political “moment” has not dramatically altered some longstanding issues students of color face. For those of us who wore drab, unadorned attire to our own graduations, these caps are a sight to behold. Some elite institutions are even restricting this type of expression during commencement, aiming to preserve the supposed sanctity of the hallowed occasion. But it is because this rite of passage is so esteemed that our students seek to stamp it as their own. They are fashioning an evolving symbol into something that does not merely confer status or respectability. Rather, their caps are assembled with the blood, sweat, and tears (and sequins and fake flowers) of their transgressive, fulfilling, challenging, resilient, and sometimes mundane educational experiences. When graduation exercises come to a close now, there are cheers and air horns at CSU Long Beach; however, students do not launch their mortarboards into the sky. The students themselves are upwardly mobile, but their caps—and by extension their identities—are firmly fixed in place. Esa Syeed is in the sociology department at California State University–Long Beach. He studies education, inequality, and social movements. To see more caps or submit your own design, visit hatsofflongbeach.com.